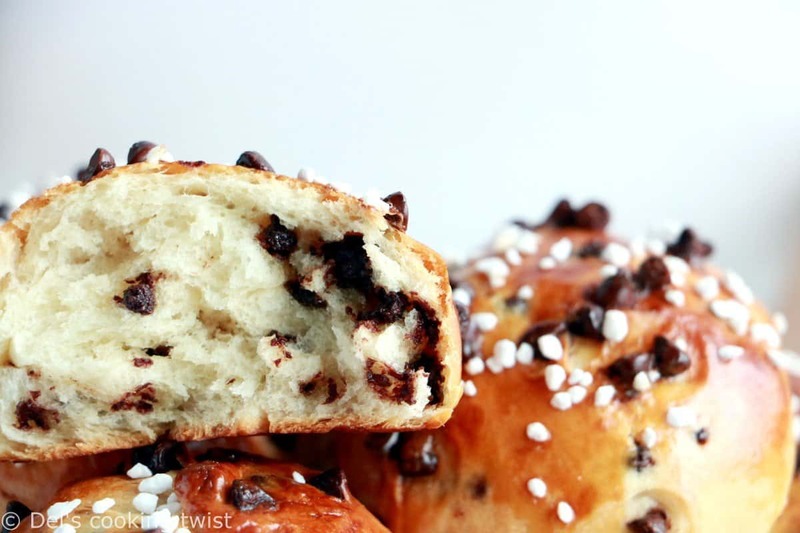 Easy chocolate brioche buns are a perfect addition to your breakfast basket. 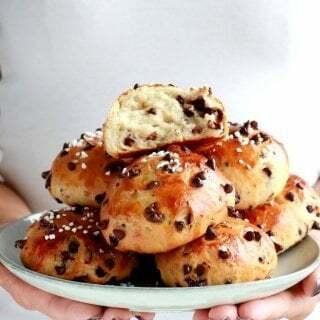 They are soft, pillowy, and loaded with chocolate chips. Here we are again; it’s time for my monthly French baking challenge with a new recipe and I’m all excited about it. In case you missed it, I started this personal challenge in the beginning of the year and this is my eleventh recipe of the kind. 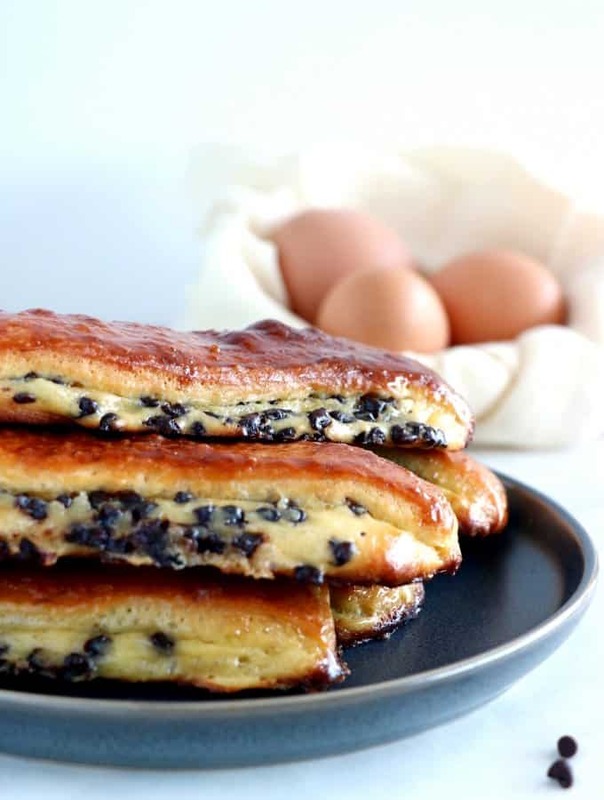 All recipes have a special place in my heart and are somehow reminiscence of my childhood in France. 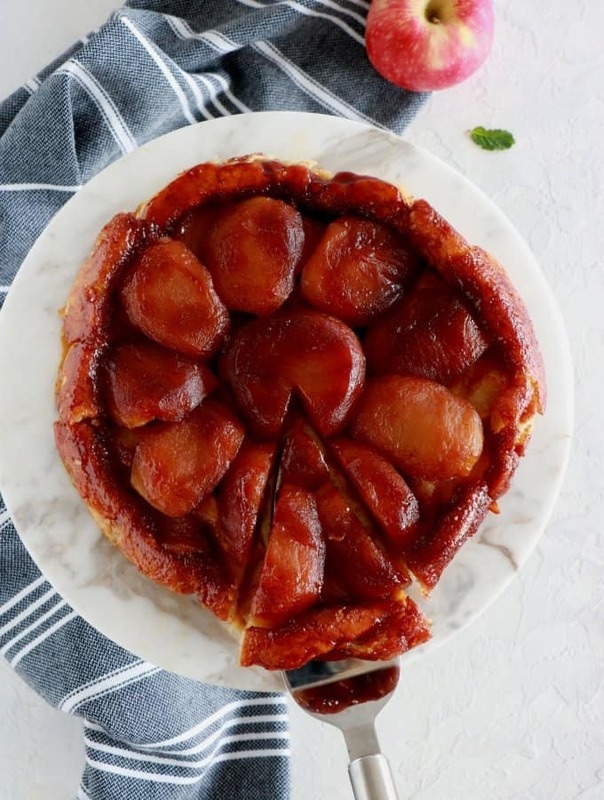 Among others you can count the Apple Tarte Tatin, the French Lemon Meringue Pie, or the Canelés de Bordeaux. Today’s recipe is making me ridiculously happy for two obvious reasons. First of all, it involves chocolate chips. Mini chocolate chips in that case, to be exact. Don’t you love chocolate chips too? 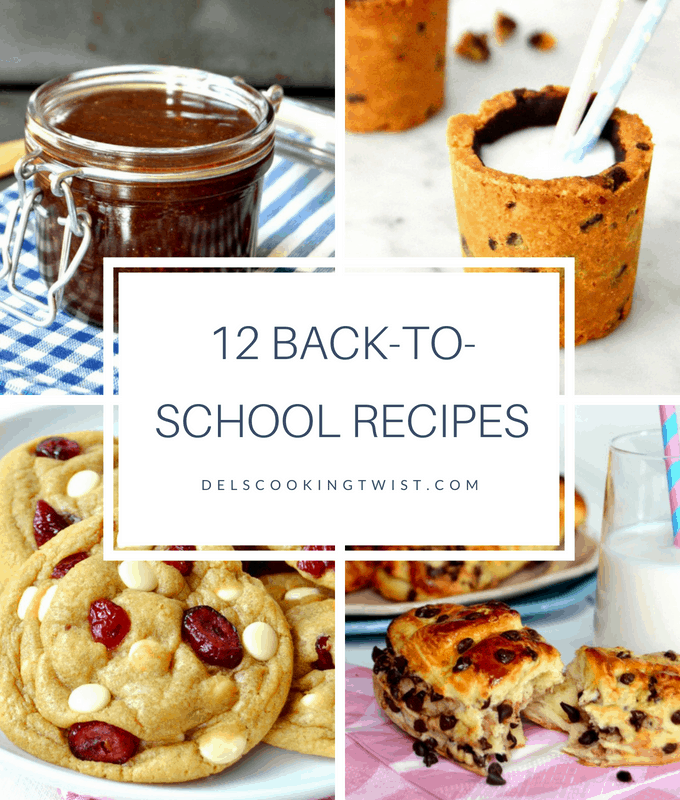 My favorite are always the ones that fall of the baking goods; you know the little extra ones you always want to grab even though you have plenty of them in your treat. But the ones who don’t count are actually the ones that matter. They are just extra stuff, and we love extra stuff. Weird, but true. The other reason why I’m so excited about this new recipe is because it involves a rising dough. I have always loved kneading doughs by hand and find it quite relaxing most of the time. Believe it or not but all the recipes involving a rising dough that I have created since I moved to the US a couple of years ago were kneaded by hand as I never bought a new Kitchen Aid after I left mine behind me in Europe. But guys, I have got news for you: I finally decided it was time and purchased a new one, the Artisan Red Kitchen Aid. I received it this week and I already have tons of recipes I want to create with my new friend now. To be really honest with you, I was not completely sure that a stand mixer was absolutely necessary after I left mine behind me. It is part of the reason why I waited so long to purchase a new one (together with the fact that I had no idea how long we would stay in the US). Lately however, I have been working with more delicate recipes that are obviously way easier if you use a stand mixer. It prevents from creating a mess while kneading the dough on your counter top and insure the right texture to your bakings. As an example, the stand mixer will considerably be a good help to get a light, soft, airy and pillowy texture to a French Butter Brioche, when it might end up too compact if kneaded by hand. This applies to any other brioche recipe, especially when they involve great quantities of butter and eggs. Today’s brioche buns are on the edge: with just a little experience, you can get a really good result by hand (this is what I did) but a stand mixer will spare you the extra effort. So if you are into serious baking too, a stand mixer is definitely to add on your (Christmas) baking gift list. 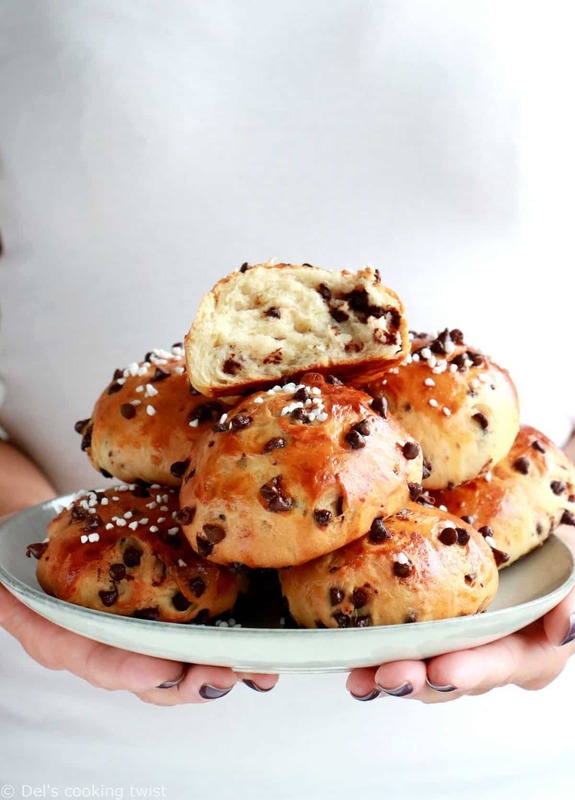 French in all aspects, these chocolate chip brioche buns are a kids’favorite after school or a lovely family treat to enjoy for a cozy brunch or breakfast in the weekend. Much easier to prepare than chocolate croissants, they involve just a few basic ingredients, to which I added some orange flower water for extra taste. If you don’t have any, you could use juice and zest of a freshly squeezed orange, making sure you keep the same proportions. As for the chocolate chips, I went here for mini chocolate chips which in my opinion are the ones that work best for the buns. If you can’t find your hand on it, go for regular chocolate chips. 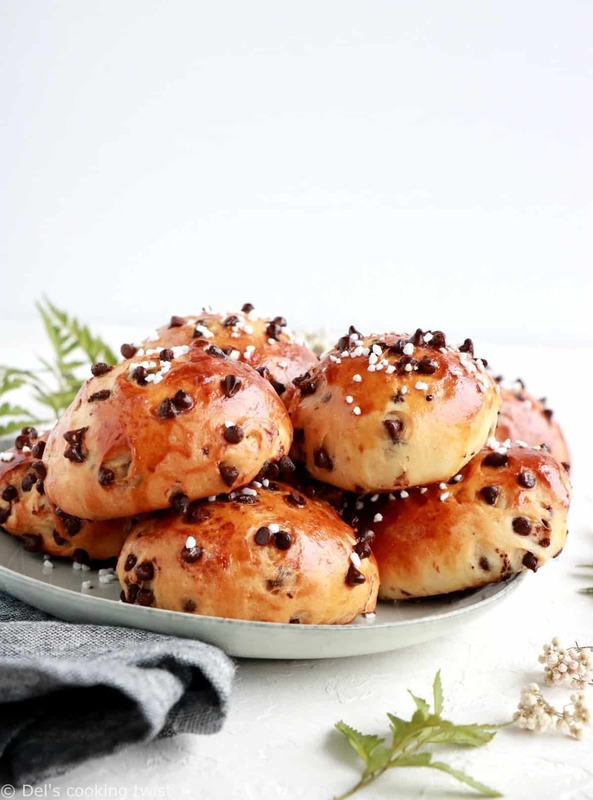 You could also replace with candied fruits and pearl sugar, or enjoy the buns plain. For this last version, I would top them with pearl sugar, divide in two equal parts while still warm, and spread with butter and jam. 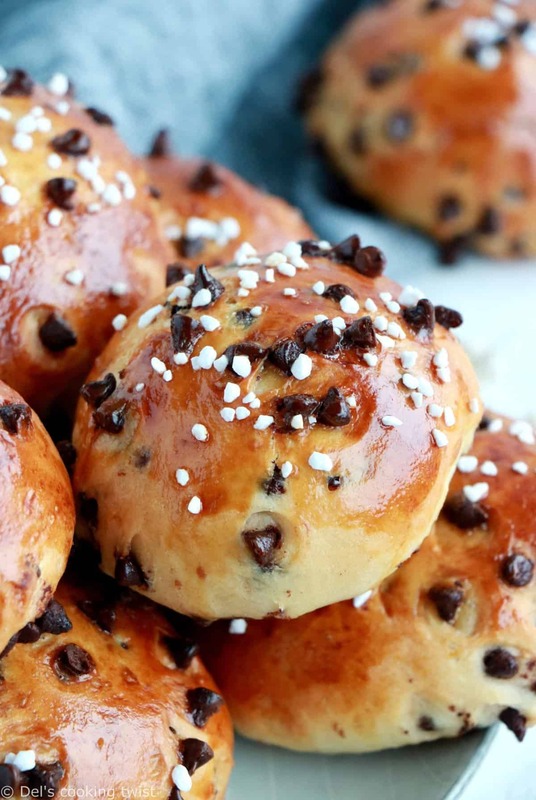 Keep in mind that brioche buns always taste best freshly baked from the oven or the same day. My trick to keep them longer consists of wrapping them in a hermetic ziploc bag until the following day. Remove them from the bag, warm them up a couple of minutes in the oven to recreate the crispy crust, and enjoy. Sprinkle fresh yeast in a small bowl and stir with one or two tablespoons lukewarm milk and a little bit of sugar too. Set aside for about 10 minutes. In a large mixing bowl or in a food processor, combine the flour with sugar and salt. Make a well in the center and add the egg, orange flower water, yeast and milk. Stir well, then knead the dough for about 20 minutes by hand, or 10-15 minutes in a food processor until smooth. Add the softened butter, diced, then continue kneading until well incorporated. The dough must be smooth and slightly sticky. 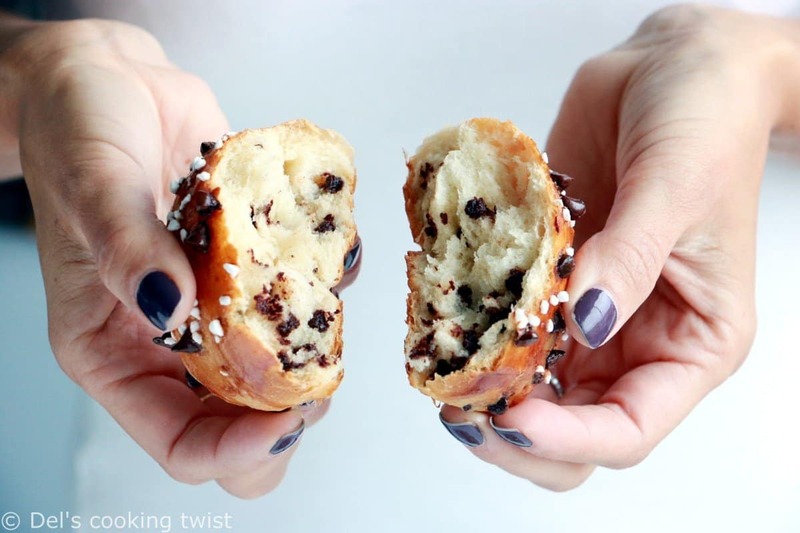 If the dough is a little bit warm, let cool for a few minutes at room temperature, then add the chocolate chips and spread evenly in the dough. Cover the dough with a cloth and let rise at room temperature for about 1 hour or until the dough has doubled in size. When the dough is ready, punch it a little bit to remove any air bubbles. Place the dough back in the bowl, cover with cling film, and place in the refrigerator for about 3 hours or ideally overnight. Divide the dough into segments of 2.3 oz (65g) each and shape into small balls, rolling them smoothly with your hand on a lightly flour surface. Do not overwork or the chocolate will melt. Brush with the yolk-milk mixture, cover, and let rise for 1 hour. Preheat the oven to 350°F (180°C) and brush one more time with the yolk-milk mixture. Bake for about 15-20 minutes, or until the brioche are golden-brown. Transfer to a rack and let cool completely. Ça a l’air délicieux ! On adore ce genre de petites viennoiseries chez nous, merci pour la recette ! Je suis entièrement avec toi. 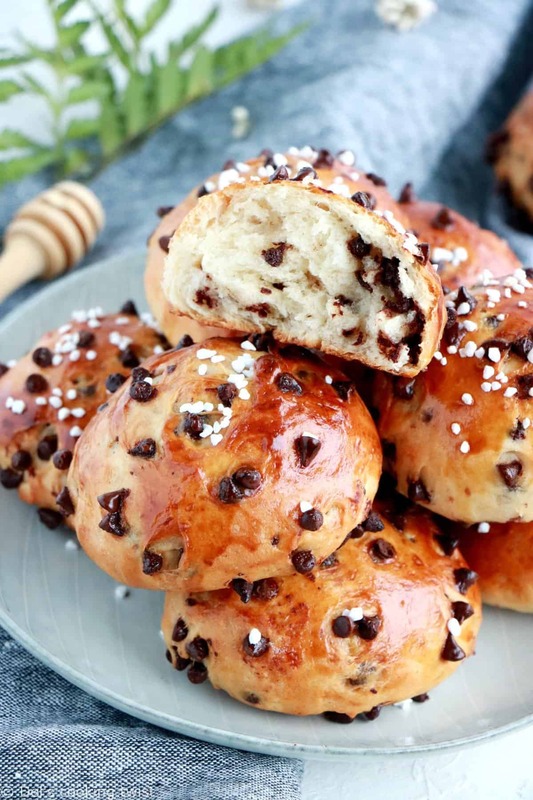 Ces petites brioches sont tellement douces, moelleuses… rien de tel pour mettre de bonne humeur dès le réveil ou au goûter ! Quelle merveille ces petites brioches, je ne résiste pas ! Depuis quelques temps, j’ai aussi envie d’un robot pâtissier, je me dis que je pourrais faire des brioches, de la pâte à pizza…parce que le pétrissage à la main, c’est vraiment fastidieux! 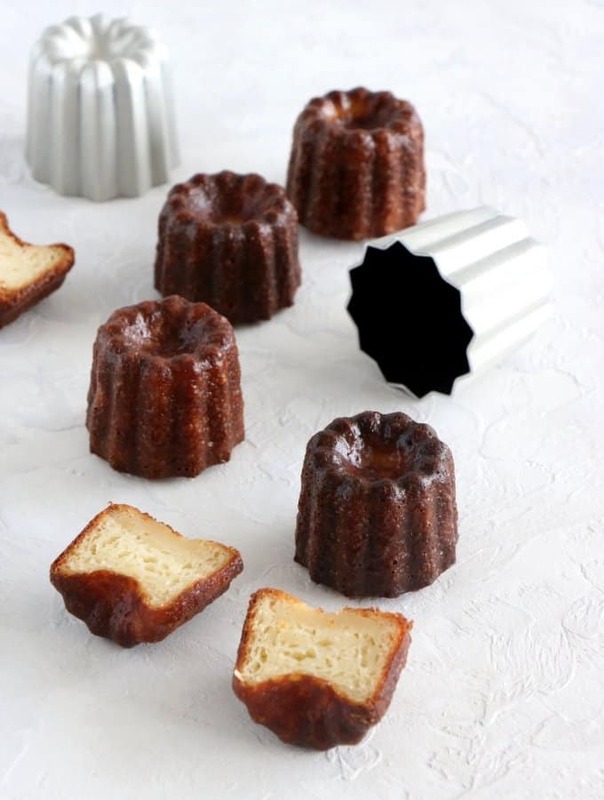 Hmmm… excellente idée que de faire des manalas, j’ai déjà faim! What if fresh yeast is not available?Can active dry yeast be used instead?